Is Taito rounding up the gang for a reappearance? If Taito's latest filings at the United States Patents and Trademarks Office are anything to go by, we might well see a number of its Super NES titles on their way to the Wii Shop Channel. Darius Twin, Lufia & The Fortress of Doom, and Lufia II: Rise of the Sinistrals have all had trademarks applied for recently, suggesting they might appear on the Virtual Console at some point. The company is perhaps best known for developing Bubble Bobble and Space Invaders for the NES and SNES respectively. If upcoming VC instalments is indeed the case, then fans of side-scrolling shooters and RPGs are certainly in for a treat. 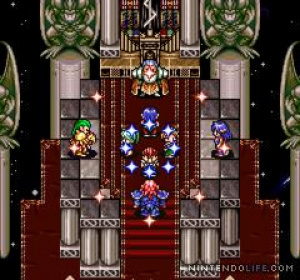 Darius Twin was actually released on the Japanese download service earlier this year in April, but if you're not familiar with the Lufia series, head over to our review of Lufia II: Rise of the Sinistrals to see why this turn-based RPG is amongst the best in the genre. Finally!!!!! Pleasepleasepleasepleaseplease come out on the VC. Always love to read about VC support. It's nice to see that Taito is supporting the VC. They're also well-known for making the very fun Bust-A-Move/Puzzle Bobble titles. My sister might enjoy Bubble Bobble. I always loved the Lufia series IMO they are as good as the SNES Final Fantasys. I just got the DS remake but I will buy it again for VC along with the first one. I'd get all 3 when they're released. I'm so excited that I have to keep my hands above the desk console and in sight. Awesome! These all look like great games and one of them has my name in it's title. @mariofanatic128 - Your name is Doom? Awesome. I'm thrilled, but the same happened with LucasArts and not a single N64 title has been released. Rise? Darius? Twin? I'm gonna go with Fortress on this one. Lufia... so much memory. Please Nintendo let them do this! MOAR RPG on the VC plz! Lufia 2 would be cool. Except I don't think Taito had anything to do with Lufia 2 here in the US like they did the original. I still hope it shows up on the VC. Lufia 1 was alright, but not in the same league as Lufia 2. VC Support?! Crazy talk. But I might forgive a little if I see some Lufia. @Corbie: Taito developed the games, but the publisher for America was a variable. In the case of Lufia 2, they handed it off to Natsume. It'd be just like Squenix (who now owns Taito, of course) to find a way to obtain full rights to the English release. I'm not terribly concerned about it. A port's better than nothing! Definitely want to get Lufia 1. Lufia II would be better if the NA release could somehow include the bugfixes from the PAL version, but I know that's just wishful thinking. Awesome news. Didn't want to play the remake of Lufia 2 until I played the original. No love for Lufia 3? ever? I wasn't aware that The Legend Returns was any good? @KingMike: Well, they probably COULD include bugfixes...they have occasionally made small edits to VC games, and we can all agree that would be an EXCELLENT option. I agree it's not overly likely, but we can indeed dream. @Zarro Tsu: It was a decent game, but far, far too long for the gameplay to uphold, IMO (never got past the second Sinistral, and I played quite a lot before getting bored). Regardless, it's a GBC game and therefore has nothing to do with the current discussion anyway. @Mickeymac: It's not so much that it's BAD as it is a pretty huge gameplay departure, and as I said above, too long to support the randomized-dungeon approach, IMO. Taito, one of my favorites! @oldgamesonly - no Puzzle Bobble series? @stuffystuffandmickeymac You're both wrong, it's sinistral! Nice to hear! But for the love of god why is it taking Capcom so long to release Mega Man 5? I've said that one too many times, but it's getting ridiculous. Always glad to see more VC support. So rare these days. Capcom and Konami have simply disappeared from the VC scene, with so many classics of theirs unreleased. I hope Taito eventually releases Bubble Bobble 2. It's so rare it usually runs over $100 just to get it in acceptable condition on Amazon! Capcom has a big lineup of VC Arcade games set to release next year, but Konami has been MIA since Dracula X and no word of any further VC support. I was also just gonna say what you said about Bubble Bobble 2, I'd love to see that on the VC just because I'll never get to play it unless I emulate it. I would love to see the arcade port of Bubble bobble and Bust a move from Taito. I remember going to arcades playing the crap out of Bust a move. It is a great puzzle game. With i think very nice replay value. COME ON TAITO BRING US SOME MORE VC GAMES! The DS Lufia was a huge dissapointment to me. So I really REALLY hope te SNES versions come VC. Lufias are coming to the VC? If so I may avoid buying the SNES cart for now until more news is annunced. I still have my SNES and all three of those carts, so I'm not terribly excited, but what Squenix/Taito should do is a Darius "rebirth" for WiiWare, two-player of course. I'd download that in a heartbeat. @oldgamesonly: Great games you mentioned, especially Kickmaster. I am about to have the biggest joygasm I could possibly virtually have, lol! PLEASE LET THIS COME TO BE! You folks who haven't had "Lufia proper" will absolutely enjoy these two games. Just be warned on one thing: Lufia and the Fortress of Doom's battles made you decide which (if multiple) enemies you would attack-- a la Final Fantasy I, if that enemy is dead already, and you were lined up to attack them, you will attack thin air. If you can get past this old development misstep, then the rest of the game is really, really enjoyable. Furthermore, everyone would get to know THE Lufia for once. Thank you for the reminder about Capcom. I'd forgot all about the upcoming VCA releases (I guess because I already have a couple of Capcom Classics Collection titles). Hope they one day release an arcade-perfect Street Fighter II. Unimaginably, one has never been released (even Street Fighter Collection 2 has smaller sprites, etc.). Konami's absence is the real devastating one for me, because I never got a Genesis, and have dreamed since announcement of VC on the Wii of finally playing Castlevania Bloodlines, and Contra Hard Corps. Now, the latest prices on Bubble Bobble 2 at Amazon. Low end is one for $137.45 in Very Good condition. One in Acceptable condition with game in mint conditions, but wear on instructions and box is $299.99. One brand new is $400. Too rich for my poor blood, so yeah I'm happy for more VC support from Taito! I'll still try Lufia II: Rise of the Sinistrals (either SNES original or DS remake) before I play the first game. I always heard that the second game takes place in the events before the first one. @StarBoy: That is correct...as a matter of fact, Lufia and the Fortress of Doom starts with the ending of Lufia II: Rise of the Sinistrals. Then Lufia II came out and had much nicer visuals and an improved battle system, making the whole thing kind of weird. I played Lufia II first, and it's definitely the way to go story-wise. Gameplay-wise, not so much. Do you seriously have a copy of Bubble Bobble 2 for the NES? @brooks83: I do, yes. It sits, with manual, safely inside one of those plastic NES game cases. The box might be somewhere in the basement, too. @brooks: Strictly speaking, I didn't "get" it at all...I was only 4 when it released. I suppose my dad probably bought it around release, as I don't remember ever NOT having it. @StarBoy91 never played Puzzle Bobble but i know of it.